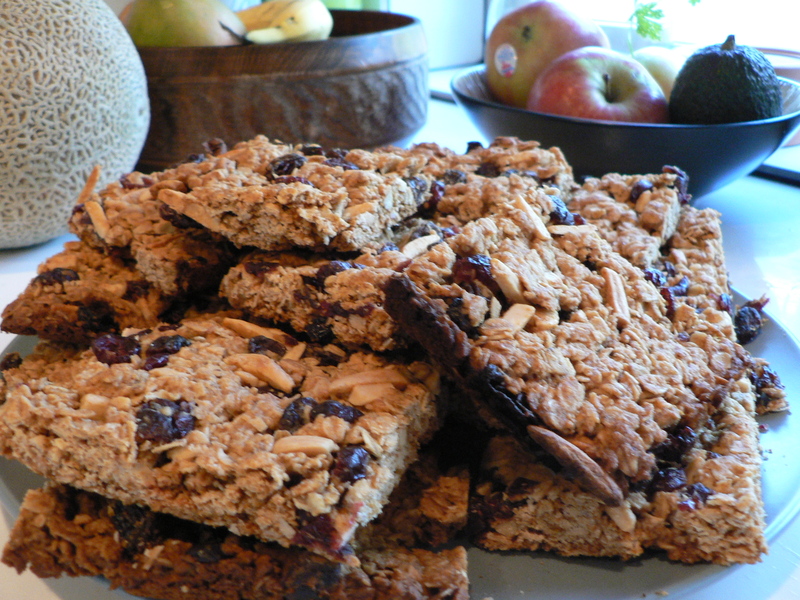 These granola bars make a great quick snack on the run or a fast and tasty breakfast. Out of all the recipes I have found for granola bars this one has the least amount of sugar (and whole wants mounds of sugar for breakfast!?!) They are very easy and you can substitute different dried fruits or nuts, and even add mini chocolate chips, to suit your taste. Preheat oven to 350 and lightly grease a 9×13 pan or cookie sheet. Combine oats, flour, baking soda, vanilla, butter, honey and brown sugar. Then stir in almonds, raisins and cranberries.